It was a few weeks when I was taking a morning flight from Detroit to Chicago Midway airport. As the blue and orange Southwest plane descended over the South Side of Chicago, I was able to see far northern part of Beverly Country Club. I could only see a couple of holes — a par 3 that runs to the southwest and a dogleg par 4 that runs along the northern border of the course. It was a quick glimpse of a Donald Ross course that is supposed to be quite good and the sight of the course allowed me to think about golf for a few minutes instead of the fact that a delay out of Detroit meant I wasn’t going to make my connecting flight. A few days later, I was in Fort Worth, Texas and I spent a little bit of a Sunday afternoon trying to see how much of Colonial Country Club I could see from the road. With a couple of hours to kill, I drove around the perimeter of the Perry Maxwell course that I had only previously seen on television. The fence around the perimeter didn’t allow me to see much, but it was worth a shot. For me, 2013 was the year I got back on the road. During my days as a sportswriter, travel was a big part of my job. For at least part of the year, I was one the road on a near weekly basis. But over the past six years or so — when I transitioned to being a metro reporter and then moved into the PR world — there was nearly zero work travel. With a new job that started in early 2014, I again hit the road. I think I made 10 work trips over the final nine months of the year, trips that included the following stops: Dallas, Phoenix, New York, Miami, Houston-Austin-San Antonio, Dallas-Oklahoma City, New Orleans, Memphis-Little Rock, San Antonio (again), Detroit, Dallas (for a third time). I certainly didn’t play golf on every trip, but I did tee it up on four of the trips. But I probably included a little bit of golf on nearly every trip. As was the case in Fort Worth, I’m a bit of a golf course stalker. If I’m staying near someplace cool or even if I’m nearby, I’m probably going to at least give a course a drive-by. Sometimes I look from the perimeter, sometimes I’ll swing through the parking lot. I checked out the parking lot at Oak Hill CC in San Antonio, a Tillinghast that was hosting the Texas Mid-Am when I was there. I drove around the perimeter of TPC Southwind in Memphis, a course that hosts a PGA Tour event and was basically right next to my hotel. We have a store right near Chenal CC in Little Rock, so I drove by there. When I stayed in New Jersey, there was a double — I stayed near Ridgewood CC (a classic Tilly that hosted a Ryder Cup) and there was a PGA Tour Superstore where I found a bunch of sweet logo Pro V1s from clubs including Chicago Golf, Butler National and Southern Hills. Being on the road did allow me to actually play a little golf as well. In addition to the biggest surprise of 2013 (a topic for a separate post), I got an early start on my season in Phoenix, played my first ever Perry Maxwell course during a trip to Oklahoma City and spent a lovely afternoon on a Seth Raynor design outside of New Orleans. While I had been fortunate to play courses designed by most of the the Golden Era architects, I had never played a Perry Maxwell course until I had an open late afternoon in Oklahoma City. 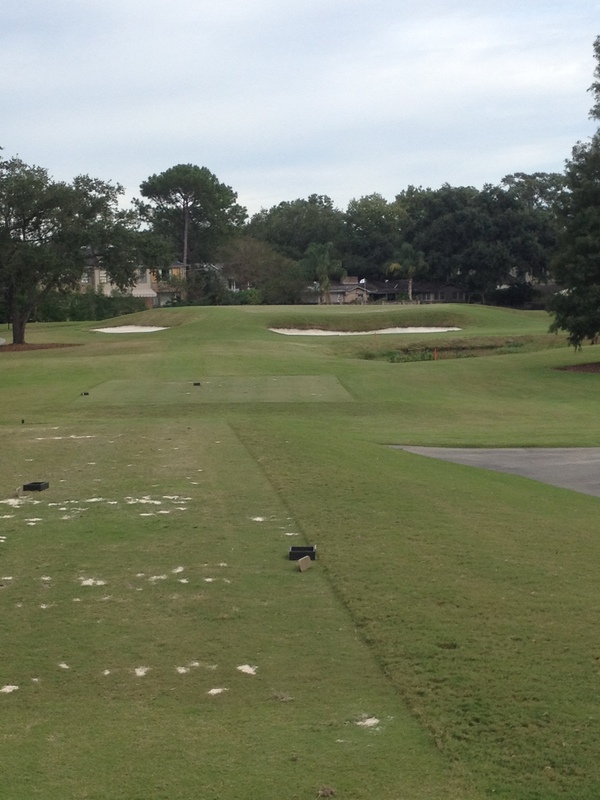 After a morning of meetings and visits, I rolled to the course and teed off about 3 p.m. It was a lovely afternoon, there weren’t many people around and I played in about three hours. 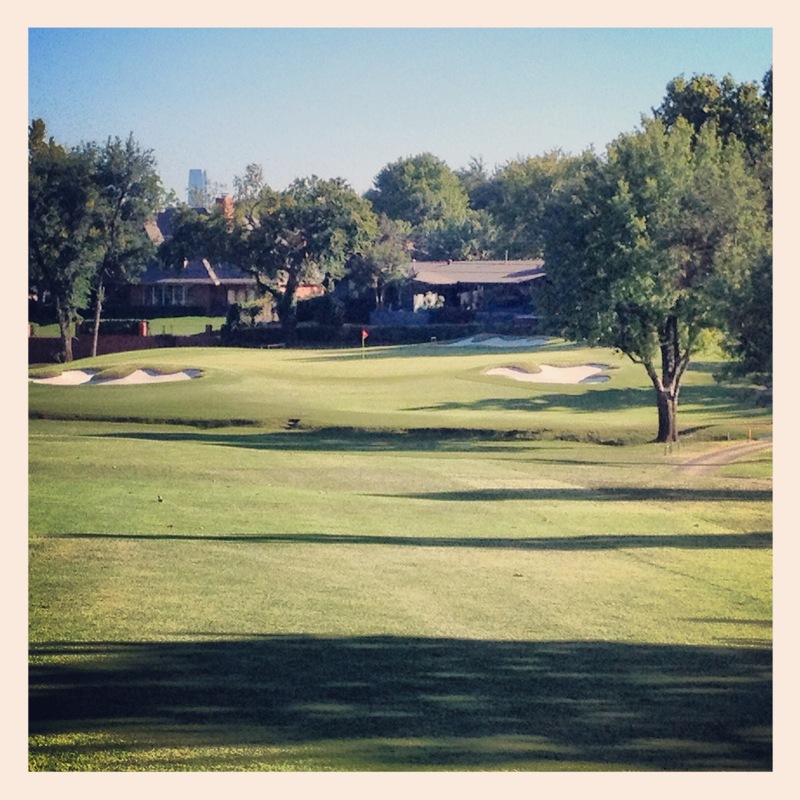 Here is a good breakdown of OKCGCC from Golf Club Atlas with lots of photos, etc. I’m not going to give a hole-by-hole, but will simply say that the routing is really good, there’s great use of the rolling terrain and the greens are super interesting. When I walked off the 18th green and headed to my rental car, my biggest takeaway was that I wanted to see more Maxwell moving forward. In early November, I had a couple of days of meetings in New Orleans. I had to be in place on Monday morning, so I had travel on Sunday. With that being the case, my strategy was to fly immediately in the morning and play golf in New Orleans on Sunday afternoon. Throw in the ability to play a Seth Raynor design and this was a total no-brainer. 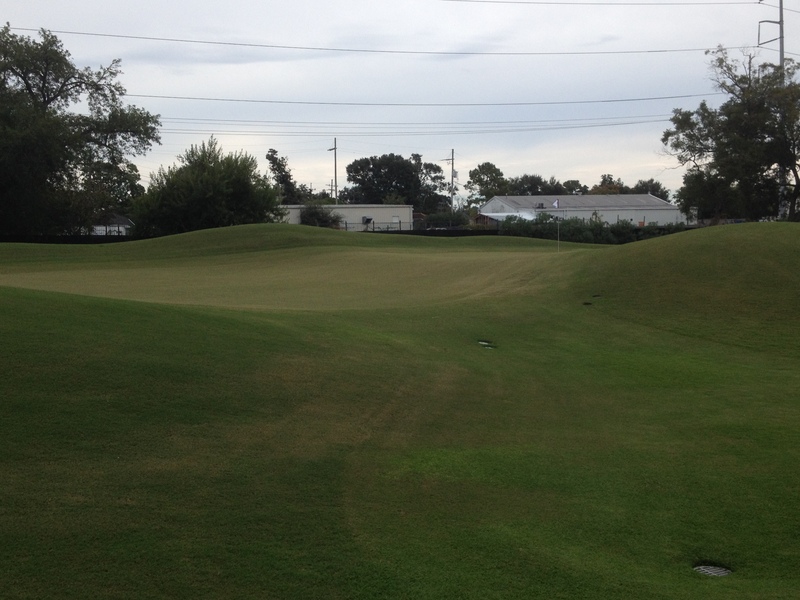 Metairie is an interesting golf course. Before Hurricane Katrina hit New Orleans, Metairie was a course that had too many trees and the word is that there were places where you could be in the fairway and not really have a shot thanks to overhanging branches (one of my least favorite things). After Katrina hit, much of the course was under water and hundreds of trees were lost. The golf course is pretty cool. There are some interesting holes and some good greens. Below is a picture of the punchbowl green. I only had a pitching wedge into this green, but that didn’t make it a lock that I was going to make birdie. You have to hit a good shot or it is going to take you more than one putt. All told, it was a good year of being back on the road. The result was being able to see some cool new courses. The reality is that I had never had an ability to play golf in Oklahoma City and who knows if or when that might be an option. It certainly wasn’t out of the possibility that I would be back in New Orleans, but who knows when that might have happened. The takeaway: Golf makes business travel better. The letter has kind of become an endangered species in my life. While I get mail on a near daily basis, most of it from people who want me to buy something. I pay bills online, I read magazines on my iPad and most of my communication with others is done via call, text, email or tweet. So when I received a letter envelope from the business owned by one of the other members at my golf club, I wasn’t exactly sure what to expect. When I opened it, I was very pleasantly surprised. The letter, which was sent to all of Western Golf Association Par Club members at my club, told of how one of the caddies at my club was selected to receive an Evans Scholarship at the University of Minnesota. He has a great ACT score and wants to study physics. And it means that next fall, our club will have three Evans Scholars on campus at the U of M.
Now I’m not someone who takes a caddy on a regular basis. I like to carry my bag, but I believe in what the Western Golf Association is trying to do — they get kids into college. So I happily contribute a small amount through payroll deduction at my office and I have another small amount billed to my Amex each month. Having previously worked in higher education and having seen students transform during their time on campus, I probably have a bit of a soft spot for education and, as a result, the Evans Scholars program. So this was a great letter to receive. So Shattuck wants to become a golf power? Sometimes you stumble upon some wild stuff on Twitter. Today’s find was this story from Golfweek about Shattuck-St. Mary’s new on-campus indoor golf facility. I find this pretty interesting. Shattuck is a fancy expensive prep school about an hour south of Minneapolis in the town of Faribault. The school has become something of a hockey power as current NHLers Sidney Crosby, Jonathan Toews and Zach Parise all attended the school. The facility includes a 2,800-square-foot turf room with a putting and chipping green, a 550-square-foot video and putting analysis room with JC Video software and TOMI putting system, a 700-square-foot study room, locker rooms and offices. “Our whole goal was to mimic some of the top facilities in the Midwest, look at their facilities and try to emulate as best as we could those things they have and what would give our kids the best opportunity to practice and call a home,” Higdon said. The program has players from all over the world. And the coaching staff features a PGA pro/former DI college coach and a former Big Ten women’s golfer/mini-tour player. The team plays golf nationwide and it appears that the players are going to get regular good instruction. To say this is different than the high school golf experience I had would be a huge understatement. The sad reality has arrived: Barring something extremely surprising, there will be no more golf in 2013 for this guy. It ended a week ago when I didn’t take my clubs on a work trip. When I booked a trip to San Antonio for the weekend before Thanksgiving, my plans were simple. I was going to work on Saturday morning and then spend the afternoon teeing it up in the afternoon before flying home on Sunday morning. I was going to potentially try to weasel my way onto Briggs Ranch, a pretty good Fazio design. Maybe I was going to try to get on Oak Hill, a cool Tillinghast that I drove around on my last trip to San Antonio. The problem, however, was a cold front and temps in the low 40s. Not exactly standard Texas weather. As a result, the Club Glove travel bag stayed in the basement and I didn’t make a trip to my club to get my clubs out of storage. Throw in the fact that a parental visit to Arizona would wait until early 2014 and the season is over. My feelings on the end? I’m OK with it. It was a good year. I played 28 different courses in 10 different states. I played 14 courses that were new to me. I played a U.S. Open venue in steady rain. I played my first Maxwell. I had a great weekend trip to Ballyneal for my first Doak experience. And I had two wonderful days playing my two favorite courses in Minnesota. It was a good year despite my lack of blogging. And I’m looking forward to an exceptional 2014. At least Rickie Fowler can make fun of himself. As some one who appreciates having a paycheck deposited in my bank account every other Friday, I have great respect for tour caddies. They do way more than simply carry the bag, clean the clubs and rake bunkers. Much (most?) of their job is keeping their player in the right frame mind. Sometimes that means not letting the player get too excited and too fired up. Other times that means pumping the player’s tires and keeping them going. They also have to make sure the player doesn’t forget those key swing thoughts or make any dumb course-management decisions. I only have a tiny bit of caddying experience. When I was in college, I looped for a really good local pro in a bunch of tournaments such as the Tapemark, State Open, etc. My job was helping to get yardages and by the end of the summer there was a little bit of trust built up. My player would ask my opinion on how much a putt would break or with club selection. It was hard work. You didn’t want to make a mistake or offer the wrong advice, but there was great satisfaction when things worked as planned. It was a fun thing do for a summer in the early ’90s in addition to my golf course job. The stage wasn’t that big and the lights weren’t that bright. But it still gives me a little sympathy for tour caddies. And this week has provided two examples of the hazards of the job. 1. It’s always the caddy’s fault. And they can be treated like garbage. This, obviously, isn’t true. The caddy doesn’t make any swings. And it’s funny that the caddy doesn’t seem to get a lot of credit when the player makes a good swing. Bubba Watson’s candid exchange with his caddy was caught on camera during last Sunday’s Travelers Championship final round. The video isn’t all that great for Bubba’s good ol’ boy, fun loving image. This has always been true. After all, a player can’t fire themselves. Jessica Korda, a 20-year-old LPGA player, took that to the extreme at this week’s U.S. Women’s Open. Not only did she fire her caddy — a veteran LPGA looper — during the middle of the tournament, she did it during the middle of the third round. She literally fired her caddy between the ninth green and the 10th tee and put her boyfriend on the bag. It is a tough job being a tour caddy. One that I wouldn’t want. On Friday night I did the very blogger thing and checked my traffic. The highlight was very simple. At some point on Friday, someone somewhere typed the phrase: “why does hunter mahan wear that stupid looking hat,” into Google. That in itself is pretty awesome. What’s even more awesome is that that phrase entered into Google let him or her here. Put a curve in that bill Hunter. I won’t hurt you. I promise.